You may have recently had a pool put in your yard, but if you don’t have an attractive deck to go with it, you may not be able to enjoy it as much you should. 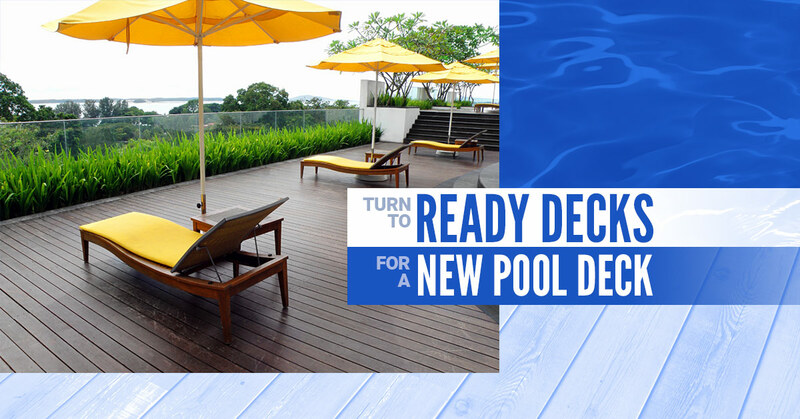 In this blog post, our deck builder will go over what to look for in your pool deck, including signs that may indicate it being time to invest in a new deck. Large cracks – Some minor cracks can be repaired within a pool deck. That said, they may be a sign of a more serious issue underneath. It’s definitely possible to buy some time and repair cracks on your own to avoid any tripping injury. Larger and more noticeable cracks, on the other hand, point to replacement as the most sensible solution. Pooling water – You probably know that pool decks should have proper drainage so that water can’t pool on the surface. If you see that there are small pools of water that do not dissipate quickly, it could be time for a new deck. Outdated or ugly appearance – It’s possible that you’ve done everything in your power over the years to ensure that your pool deck looks great. But as with other major structures, pool decks wear down and lose their pleasing aesthetic look. That’s why it’s important to invest in pool decking options that enhance the overall appearance of your home. Through this eight-step process, the experts at Ready Decks set themselves apart from other decking companies. Our deck contractors use a 4×4 through-post design to ensure additional stability and the strongest handrail possible. Our deck builders use topcaps to add strength to handrails, providing a wide, stable surface for plants, food, drinks, etc. We only use treated, premium-grade lumber for our customers. Ready Decks doesn’t settle for anything less than the highest quality. The 2×2 balusters extend to the joint so the toprail resists sagging. Feel free to ask about add-ons and customizable options in this step. Our 2×6 framing system never overspans thanks to our patent-pending deck installation system. Our affordable decks are built atop The Footing Pad By PolyVuk, which is specifically designed and manufactured to protect posts from damaging soil and moisture. The Ready Decks “trip-saver” boards not only allow for a safer deck but also a more beautiful appearance. We can take your project a step further by turning your new deck into a Ready Porch. From pool decking options to pergolas and more, the professionals at Ready Decks are your local deck builders. Call now and ask about financing.